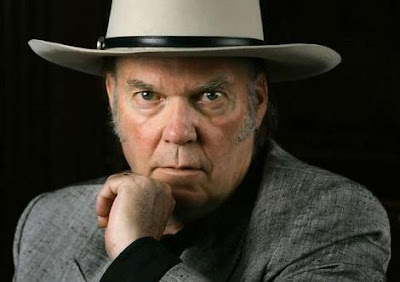 RollingStone.com is reporting that Neil Young's next album will be produced by Daniel Lanois, a surefire dream pairing that will most likely result in a "very heartfelt record," according to David Crosby. Lanois produced Emmylou Harris' breakthrough album, Wrecking Ball, which was named after one of Young's songs. As you might know, Young is set to embark on a solo-acoustic tour this summer with folk legend Bert Jansch. If you're near a show, I can't emphasize this enough: stop what you're doing, buy a ticket, and simply go. Don't complain about ticket prices. Just go. Neil Young is the best solo-acoustic performer I have ever seen, and he hasn't toured solo in the U.S. since 1999. He does that [solo acoustic] thing probably better than anybody. One of my most favorite concerts of his was him at the Wiltern in Los Angeles. He had a circle of his guitars around him and a chair, and he walked out there and sang. It was mesmerizing. He's a fantastic musician, but also a great storyteller. I was standing there in the wings with Bob Dylan. He and I are huge Neil fans, and we didn't move. We stood there the entire concert and just watched. We were as mesmerized as much as the audience was.